German cooking started for me around mid-September. My extended family – in-laws and brother-in-law – asked me what I wanted for my birthday. What I really wanted was an iPad but I thought that I should realistically just ask them to buy me a couple of cookbooks. My wife and I diligently went to Barnes & Noble, picked a few good-looking cookbooks and off went the Amazon order. A few days later, a parcel delivered to my doorstep had the books I wanted. Disappointed it wasn’t an iPad (hope never dies, you know), I shelved those books, until the time was right. One of the books was The German Kitchen (2013), very picturesque and enticing in the simplicity of its everyday menus. It was Oktoberfest that reminded me of The German Kitchen. Columbus, OH – where we live at the moment – is a very German city. At some point, apparently, as much as 1/3 of its population was German. Not surprisingly, the city oozes German influence, from pretty much every other person I meet having a German name, to a quaint and cozy neighborhood called German Village that features a few sausage houses (I will talk about those in future posts), and, of course, Oktoberfest. This year it was held at the end of September, with temperatures still high enough that you are dying to quench that thirst of yours with a cold brew. And what goes well with a good beer is a great bratwurst. Before long, I had 3 cold 32 oz’s and 2 mega-bratwursts, listened to some polka, admired what people were wearing, and was happily heading home in a passenger seat – my wife graciously volunteered to be a designated driver. The next day my somewhat foggy vision finally focused on the shelf where The German Kitchen had spent the last 3 weeks. And the real Oktoberfest began! 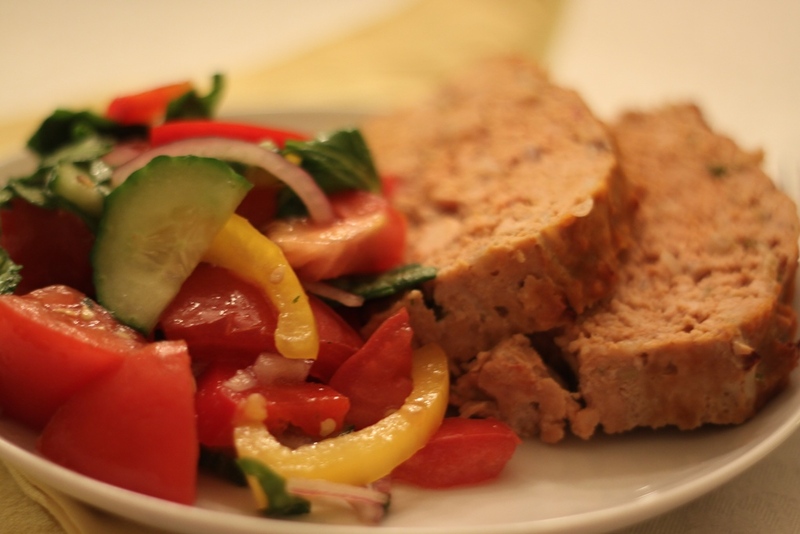 I made a few dishes from the German cookbook but here I’ll talk about the one that I found delicious – meatloaf. Meatloaf is not what you would call a unique German dish. Every nation, apparently, has come up with some kind of equivalent to what we know as “meatloaf”. So what we do we know about it? Meatloaf is a dish made of ground meat in a shape of a loaf. Essentially, it’s one big meatball that someone thought of making into something more presentable and economically viable – it is easier to make a meatloaf than meatballs, after all. And in the US, meatloaf was voted in 2007 the 7th most favorite dish. Back in the Great Depression, meatloaf was a way to stretch the budget and make a meal out of relatively cheap ingredients. Obviously it has outgrown its frugal roots and stayed on as a regular staple. So there you have it. Wikipedia lists 20 countries that have their version of meatloaf, but I bet the list could go beyond that and every nation has some kind of dish made of ground or minced meat. Remarkably, most European cultures use a boiled egg inside the meatloaf – to decorate it with white and yellow rings, or to enhance taste. And I can think of a few personal favorites that happen to be meatloaf’s second and third cousins – hamburgers, meat balls, kebabs. 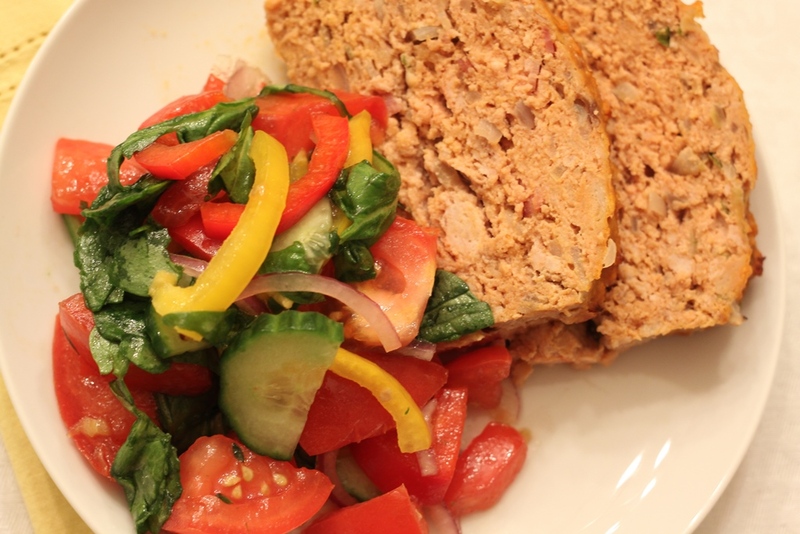 Now that I’m so intrigued with many different ways to make meatloaf, I will return to the subject in my future posts. For now, though, let’s talk briefly about Falscher Hase, the German version of meatloaf. Heat the oil in a frying pan, add the bacon, garlic, and the brown and red onion. Sauté until the onion is soft then set aside to cool. Cut the bread into cubes, place in a bowl, and pour milk over it. Leave to soak until the milk is absorbed by the bread. In a large bowl, combine the onion and bacon mixture, the bread mixture, the ground meat, eggs, tomato paste, and salt and pepper and mix well, then add the parsley. Oil a loaf pan well and spoon the meatloaf mixture into it. Bake for 50 to 60 minutes or until cooked through. Let it stand to cool for five to ten minutes before slicing. Garnish freely with fresh flat-leaf parsley and serve immediately with fresh seasonal vegetables or fresh garden salad with relish and chutney on the side. Today we had a bit of snow again, and it’s all downhill from now, all the way to April – if we’re lucky. Between now and then though, there will be Thanksgiving, Christmas and New Year’s, with many celebrations and family gatherings. Make sure you enjoy a warm, delicious meal with every chance you get, and don’t forget to share the moment with your family and loved ones. Why not have meatloaf on one of those days? Stay warm and stay healthy, and we’ll keep on looking for more ways to help you do just that. This entry was posted in European, German, Meat. Bookmark the permalink.